Odebrecht's former director in Peru, Jorge Barata, told prosecutors that he donated $3 million to the 2011 presidential campaign of former president Ollanta Humala. Barata stated that cash was given to Humala's wife and former first lady Nadine Heredia in their Lima home. Odebrecht ultimately won billions of dollars in construction contracts during Humala's government. "We did not receive illegal funds from the Odebrecht company for the campaign," Humala told reporters. He also questioned Barata's credibility as a witness cooperating in exchange for leniency. Humala added that he and former first lady Nadine Heredia were cooperating with all the investigators requests, "reasonable or not." Humala also said that a former president should remain in Peru, in reference to former President Alejandro Toledo, who is currently in hiding in the United States after being sentenced to 18 months of preventive jailing for allegedly taking $20 million in bribes from Odebrecht. 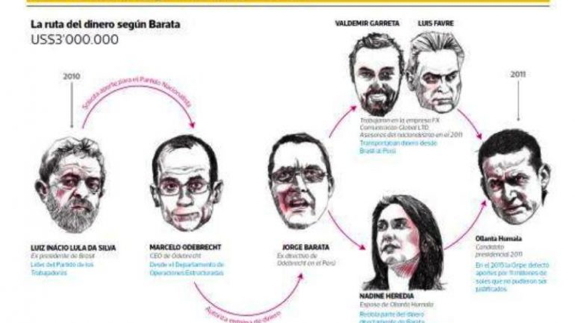 Barata stated that the funds came from Odebrecht's Division of Structural Operations, a business unit the company has acknowledged to the U.S. Department of Justice was set up to distribute bribes to foreign government officials. Humala and Nadine Heredia have been under investigation for money laundering for the last two years. Some of the information provided by Barata was corroborated by ledgers attributed to Heredia which were delivered to prosecutors in 2015. A judge in November ordered Humala to post a $15,000 bond to remain free, and Heredia must request permission to leave the country to work as a director of the United Nation's food and agricultural agency FAO. Humala and Heredia recently filed legal paperwork authorizing Heredia's sister to take their children out of Peru without their parents in what many believe is an anticipation of going to prison. If Humala and Toledo are ordered to jail this year, Peru will have three of its last four presidents in Peru including Alberto Fujimori.